We hear the constant squeaking of shoes across the basketball court. It can only mean one thing. Welcome to March Madness 2019. The best NJ online sportsbooks are ready and waiting to take all your action during the NCAA Tournament. We at PlayNJ have decided to put a few of the sportsbook apps in NJ up against one another so you can pick the best options for March Madness betting. We compared the various March Madness promotions, bonuses and betting odds on the apps. Then, we looked at the software, how easy the apps are to use, and the available deposit options in an effort to separate the good from the just OK in the NJ sportsbook app market. Here we compare BetStars NJ and Resorts Online Sportsbook. Not to be confused with the DraftKings Sportsbook that runs under its license, Atlantic City’s Resorts Casino Hotel has its online sportsbook product with its own March Madness promotion. The chief NCAA Tournament promotion running on Resorts Online Sportsbook is an odds boost on Duke to win the NCAA championship. Details were not available on the site at press time. However, this may very well help boost the odds on favorite Duke to win it all from a posted +225 to something much more significant. If so, it’s a move that would make Resorts one of the top places in NJ to place a futures bet on the team that every sportsbook in the country is making a favorite to win. The price on March Madness point spread bets sits anywhere from -108 to -112 at Resorts Online Sportsbook. Therefore, its March Madness point spread pricing is competitive. However, some of the moneyline odds seem out of whack. Looking at the South Region, the opening line on defending NCAA champion (No. 6) Villanova to beat (No. 11) Saint Mary’s in the first round was -295. It opened at -280 on competitor SugarHouse Sportsbook and an even more attractive -265 at Caesars. Head-to-head with BetStars on this game sees Resorts missing the mark again. BetStars had Villanova at approximately -285. New players who join up with Resorts Online Sportsbook, using the bonus code MAXBONUS, get $20 free with no deposit required. That same bonus code will also get new users a 100 percent deposit bonus of up to $1,000 and a match bet of up to $250. It’s a competitive bonus structure, to say the least. Resorts Online Sportsbook operates on a relatively slim software platform. However, that means it’s streamlined and as clean as they come. Its basic odds board is just that, listing all available bets by sport and league. The sportsbook platform is integrated into the NJ online casino, which means a seamless transition between casino games and sports betting. While there is nothing fancy about the interface, there’s an “NCAA Men’s Basketball” tab where you’ll find all the game odds and outrights information you’ll need. A few more bells and whistles might be nice, but who needs them really? Placing a bet at Resorts Online Sportsbook is as easy as liking a particular side and clicking on it. Need we say more? 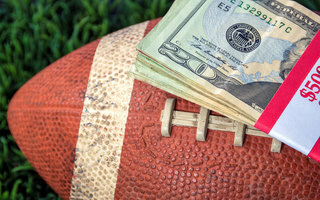 Resorts Sportsbook gives its players a choice when it comes to deposits. That choice starts with cash via Resorts’ cage and goes on to Neteller, online banking transfer, PayNearMe and PayPal. Users can also deposit with ACH/e-check, and Visa and Mastercard (provided the issuing bank is on board with the idea). There are definitely enough options. BetStars joins March Madness betting by offering a $10 free bet on Long Shots promotion. Just bet $20 on any No. 2 seed or lower to win the NCAA championship, and you’ll get a $10 free bet for every round they advance. The madness continues with its promotion of Bet Three, Get One Free. Just bet $10 on any three single March Madness points spread markets and you’ll get a $10 free bet. In all honesty, BetStars NJ promises a rotating array of promos and deals during the NCAA Tournament so this is just a quick look. For some reason, BetStars continues to use decimal odds, which means you might need a calculator to compare prices between the site and its NJ sportsbook competitors. That Euro-flub aside, the March Madness prices on spreads and moneylines are all competitive. Sharp bettors should look at what BetStars has to offer before betting elsewhere because the price might be right. The NCAA futures market is as competitive as they come, but you could get a whopping +2000 on all four No. 1 seeds to make the Final Four. It’s the kind of line that makes it seem like BetStars is interested in your March Madness action. Use our exclusive BetStars link to sign up and place your first bet, up to $50, and BetStars will hand you a free bet of up to $50. Plus, BetStars will give you another $50 free bet whenever you wager another $150, up to nine times. Add it up, and you’ll get up to $500 in free bets from BetStars, which is a pretty good deal. Plus, keep active, and you’ll get a free bet every week as well. BetStars wants your business and with a bonus like that, the book may deserve it. Everything is there on BetStars NJ. It’s just that the interface seems clunky at times. In fact, it might require an extra click or two to get to the markets you seek. That said, the software would still have to be considered easy to use. Plus, the wide variety of sports and bets available are awesome. BetStars has made a name for itself in Europe. Its foray into the NJ sports betting is so chock-full of bonuses and deals; it is now a player on this side of the pond as well. If you can ignore the fact BetStars continues to use European/decimal odds, BetStars is easy enough to use. Although the bets you want may be more than one click away. The bet slip posts instant results, so you know how much you’ll make on any bet before placing it, which is really all you need. BetStars Sportsbook accepts everything from ACH/e-check to cash at the cage via Resorts Casino in Atlantic City. Third-party payment processors include Neteller and Skrill. Plus, you can use PayNearMe, PokerStars instant online banking, and PokerStars+ Prepaid Card to get money on the site. If that’s not enough, convince your issuing bank to let you use a credit card on the site. BetStars will oblige. This is a closer battle than you might think. BetStars has a wider variety of betting options and better March Madness-related promotions. However, the streamlined software at Resorts makes everything easy. Plus, it may be the one place where there’s real value in betting on Duke to win it all. In the end, BetStars enjoys the power of more competitive March Madness lines on its way to victory here. However, don’t sleep on Resorts; it could become the Cinderella of the NJ online sports betting market in the future. Martin Derbyshire has more than 10 years of experience reporting on the online poker, online gambling, and land-based casino industries for a variety of publications including Bluff Magazine, PokerNews, and PokerListings. He has traveled extensively, attending tournaments and interviewing major players in the gambling world.